You’d think that outboard motors had wings in this county, the way they seem to fly off the backs of boats and vanish without a trace. In total, 71 such motors were reported stolen in the county between October 2009 and this month, according to Scott Wilson, Kitsap County Sheriff’s spokesman. And that number doesn’t even include ones taken on Bainbridge, nor in the cities of Poulsbo, Port Orchard and Bremerton. There appears to be a concentration of thefts in South Kitsap, though the motors have disappeared just about everywhere in the county. Kitsap County Sheriff’s Detective Phil Doremus has been monitoring such thefts and says he’s seen an uptick since the beginning of the year. It’s doubtful that it’s one person or even a single group of individuals taking the motors, he said. There’s been some arrests and prosecutions in boat motor theft cases, he said, but the crooks often get in and out before owners have even noticed the motors are gone. 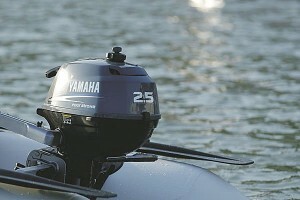 So why would thieves target boat motors? It’s not rocket science. As any boat owner would tell you, the things aren’t cheap, and prices can get into the thousands of dollars quickly. Stealing the motor is also a so-called “opportunity crime,” which is basically a way of saying they’re looking for the path of least resistance — an unlocked door or an open window, for instance — to carry out the crime. In many cases, they’re not even looking for giant, 100+ horsepower motors, but rather for a small outboard motor that can be carried by one, or perhaps two people. First, for those looking to buy a motor: Doremus does not recommend craigslist, a place where thieves have been able to pawn their stolen goods. If you do go shopping there, he says it’s imperative to check the boat motor’s serial number with your local law enforcement agency. That way, police can check if the motor’s stolen. Thieves will use a fake name and buy a temporary cell phone to post with the craigslist ad so they can’t be traced back to the theft, Doremus said. For those who already own such a motor: Dormeus says the best practice is not letting the crooks know you have a boat or motor in the first place, by locking it in a garage. He said some criminal opportunists will drive around the county looking for boats, write down an address with one, and then return after dark to take it. They might also loiter at boat ramps and then follow the owners home to find out where the boat is stored, he said. Have you experienced a boat motor theft this year? I’d like to hear from you. Please feel free to drop a note below.